Indoor / Outdoor Insect Control and Mildew Retardant. Natures Defender Insect Repellent Spray has a pleasant cedar aroma makes bugs stay away. It will kill and repel ALOT of insects, from Mosquitos to Silverfish. Very effective on Fleas and Scorpions. It's a Chemical Free, organic pest control solution -- no need to wear gloves or a mask. Spray on screens, carpet or anywhere the pests are residing. Spray in cracks, crevices where insects reside and lay thier eggs. Dries invisible and grease free. Disolves insect egg and larve. Spray in the cupboards, along baseboards and on window or door sills. Apply with a trigger or compression type garden sprayer. Will not stain carpet or furniture. Formulated with PCO Choice concentrate that is used by Pest Control Operators Worldwide. Use it as a refill for your trigger or pump up sprayer or Cold Fogger Machine. Can be diluted 3:1 if desired or use it full strength for longer lasting results. Natures Defender IRS has no effect on Beneficial Insects such as Lady Bugs and Butterflies. 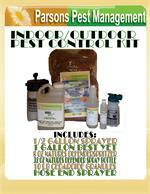 Solve your pest problems with this product from Parsons pest control today! Comes in 3 Sizes: GALLON, 32oz, or 16oz bottles.